A talk and demonstration will be presented on the mechanics of the mind, understanding it, promoting self-help through motivated self-directed change and empowerment using the auto-suggestive sciences. An insight into how the mind works. Know about the Power of Suggestion and learn how to maximize your strengths to achieve full potential. This session serves to reveal and instill awareness of the Power of the Mind for self-development. It is about understanding the Auto-Suggestive Sciences, retraining the mind to self-heal and for the enhancement of human potential. Presented with clear explanations illustrated with diagrams, simple instructions for exercises and opportunities to participate and practice techniques and ask questions in an interactive environment. Demonstrations and practical exercises are utilized to reinforce workshop effectiveness. Participants will leave using new practical tools. Be aware of auto-suggesting highly desirable personality traits directly into their brain cells, and magnetizing success in their lives by choosing the rights thoughts. Apply the knowledge that these thoughts are "commands" that are programmed to improve their inner thought processes so as to re-engineer their entire outlook on life. Dissolve stress, melt away tension and know that they can train their mind to increase their tolerance for stress, so they can work with a clear mind to solve problems... FAST! Banish negative behavior patterns, as these are silently decaying their life. Learn to re-program their brain to automatically improve performance in business, social circles, and life itself. Date: Day: TBA, based on response for a quorum. Please know that you have to request for the presentation first! No request, no events! Please read our terms and conditions before ordering or using this website. To reserve your place on this dynamic Half-Day Presentation and Demo, please make a request for it and then go to our eCart to purchase a seat once we notify you on its availability . 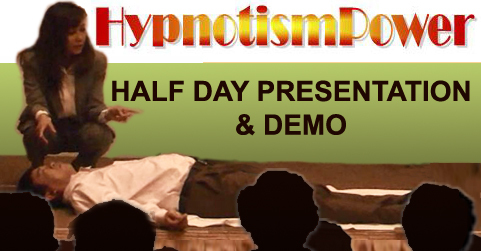 HypnotismPower uses the safe, quick and easy to use PayPal for transactions.